Have you ever seen those stinkn' cute aprons in the mall? Well this may not be EXACTLY like those cute flirty aprons, but it sure is fun to DIY and personalize your very own flirty apron. 1. Fold your dang cute fabric of choice in half. 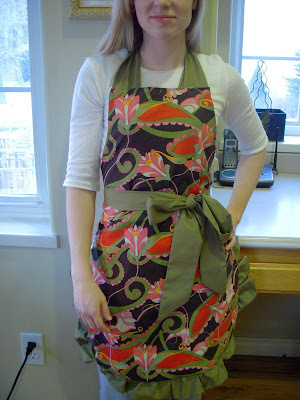 Trace your old apron pattern on the now folded fabric. Folding your fabric in half will insure that you get two apron pieces. One will be for the front, and the other the back of your apron. After tracing, cut it out. 3. Fold your 6 inch wide fabric in half and iron. Now your trim is long and 3 inches wide. 4. Sew your 3 inch wide trim on the opening edge. Make sure that your sewing machine is set to a wider stitch, or a basting stitch. After sewing this straight and very long line you will have a tube like piece of fabric. 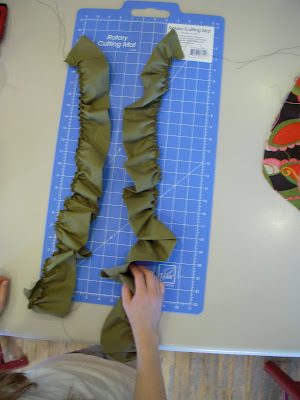 * Take one of your already cut apron pieces and lay it on a flat surface, right side facing up! * Now take your gathered trim. 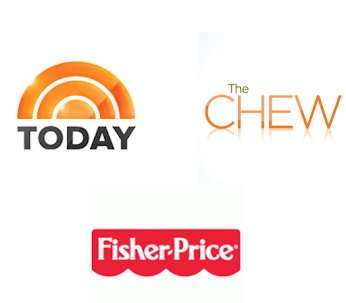 Like the above picture shows, pin raw edges together. Notice how the finished side of the trim seems to be facing up towards the right side of the apron piece. * Pin trim and first apron piece together. 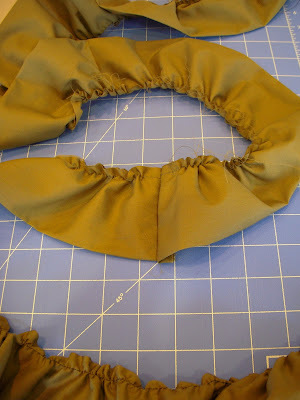 * Now take your second apron piece and place it on top of the pinned trim and first apron piece. 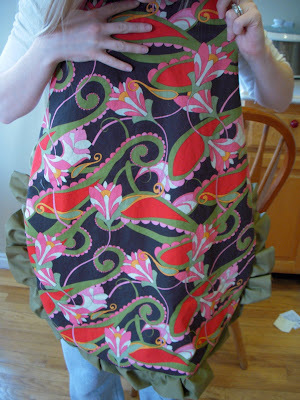 Be sure to place the second apron piece wrong side facing up and right side touching the first apron pieces right side. So basically right sides together. 7. Sew first apron piece, flirty trim and second apron piece all together. As you sew you will notice that your apron is inside out. ONLY SEW THE BOTTOM OF THE APRON WHERE TRIM IS ATTACHED!!!!!! 8. 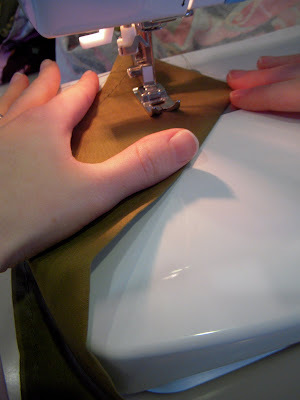 Turn your sewn apron right side out. Above is what it should look like. 9. Now it's time to make the ties. Now you will need to repeat the following steps 4 times. There are 2 ties that tie around the neck and 2 ties that will tie around the waist. Follow steps 2-4 4x. Be sure not to do a basting stitch this time, because a gathered tie would not be the most ideal for tying. Now that you have four 3 inch strips of sewn fabric notice the picture above. All of your strips should have an open top and bottom, kind of like a tube. To make your ties more finished, simply sew one side of each strip diagonally. 10. 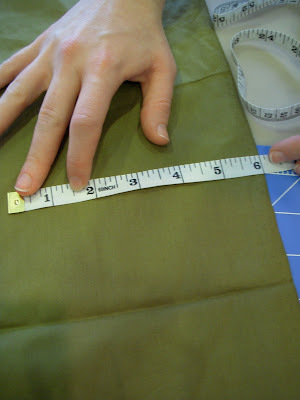 Once you have sewn each strip diagonally on one side you can use scissors or rotary cutter to cut of the excess fabric. Next, take each strip and turn right side out. 11. Iron your ties, so that they are nice and crisp. 12. Pin your crisply ironed ties to the top of the apron and the sides, and sew away! FINALLY YOU ARE DONE, your very own DIY Flirty Apron! i like...i was just looking at these yesterday. charlotte said she would make me one since it is hard to find time with three. you guys are great at sewing!!!!!! How fun!! I can't wait to see more! If you want some fun sewing ideas, head over to my blog and click over onto "Rory, Sadie, and Jess" in my "Places worth stopping along the way" section. She has tons of amazing DIY sewing projects! i love it Steph!! why do you have to live so far away? we could be craft buddies!! !